AdirMed Presents A Uniquely Designed Medical Examination Table! The AdirMed foam-padded, adjustable medical exam table is designed to offer a smooth and comfortable medical exam experience. Being extremely dependable it is made to assist the daily needs of the modern medical professional. Manufactured with a powder coated steel frame that offers extended durability and stability, it is able to hold up to 440 lbs. The steel frame has a multiple position adjustment bar for the backrest to offer convenience for the patient and a built in horizontal paper towel roll dispenser for effortless towel access. In addition, the 2" seam-free foam padding with the rounded corners allows the patient to feel comfortable during the examination. 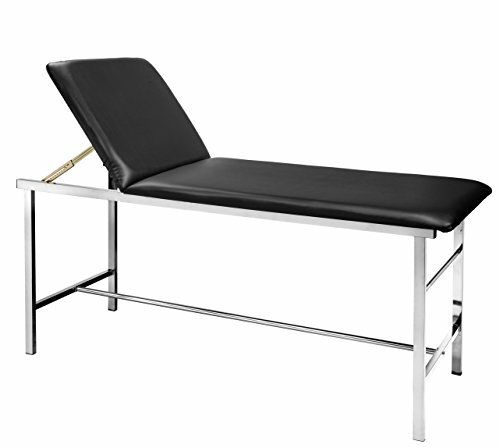 This unique, foam padded, adjustable medical table is backed with a 2-year warranty for you to purchase without any second thoughts. Don't Waste Any Time! Act Before Supplies Run Out! Click "Add to Card" & Order NOW! EXCELLENT FUNCTIONALITY. A useful and practical paper towel dispenser is integrated into the front part of the frame to maximize convenient access to paper towels for any need. Additionally, the frame has a bar that allows the backrest to be adjusted to multiple positions for a better patient approach. CONVENIENT MEDICAL EXAMINATION. Designed to offer a smooth, seamless medical exam, the AdirMed boasts 2" foam padding to maximize each patient's comfortability and an H-Brace frame for easy access to a patient from any side of the table. Plus, the table is easy to clean in between visits. LONG-LASTING PADDING. Foam padding is manufactured with resistant materials to provide long-lasting use, and features rounded corners for the safety of patients and practitioners. Furthermore, the seamless upholstery with a knitted back provides added strength and ease of maintenance. LIGHTWEIGHT DESIGN. The incredibly, lightweight construction of only 60 lbs. ensures flexibility, allowing you to customize your office space at any time. Whether the floors need to be cleaned or you need to change things up a bit, this minimal weight makes it easy to reposition the table to any new location.